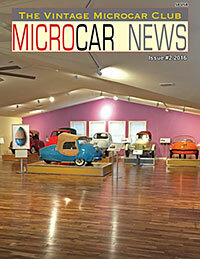 the enjoyment and preservation of Vintage Microcars, both foreign and domestic. The primary focus of the club is on the post-WWII "Bubblecars"
It is not necessary to own such a car to join. What do you mean by "Vintage"? the smaller-the better, they are essentially Enclosed Scooters. Messerschmitt KR200, NSU Prinz and Subaru 360. The 32 page all color magazine features current Microcar News, results of eBay auction listings for MICROCARS, details on Member-oriented events, technical information, reprints of period literature and road tests, restoration and maintenance tips, Microcar trivia, photos of members' cars, sources for parts and service, and a classified ad section which reaches the largest single group of small car enthusiasts in the world! News and Information you will NOT find on the Internet for Free. If you're interested in joining, click here to start the process!